• Cabin Fever, aka Happy Hour, everything on the menu is 25 percent off as well as all day Sunday (with local ID). Best of Central Oregon 2017: "Best Cocktail Menu/Best Bar"
Voted Best Bar in 2018, this bar attracts Bend's cool crowd, with an interior designed to feel like a rustic “cabin". The artisan cocktails and tasty small plates (try the deep-fried mac and gruyere balls) are the true stars. 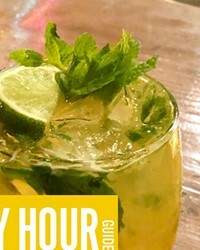 Artisan cocktails and tasty small plates abound at this hip rustic downtown “cabin.” Come for Cabin Fever (aka Happy Hour) and enjoy one of their many inspired cocktails from the “Poco Loco” to a “Thai One On.” You’ll never see cocktails the same again. Come for the cocktails, but as the night gets long, check out the crave-worthy small plates that will keep you sticking around.